1 in 100 Australians are diagnosed with autism every year. For every 5 diagnosed, 4 will be boys. Autism has life-long impacts and there is no cure. 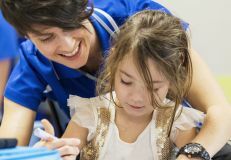 For more than 13 years, AEIOU Foundation has provided Australia’s most effective early intervention program. This program makes a huge difference in a child’s development and allows greater opportunity for education and independent living. We believe every child with autism should have the right to early intervention, but we need your help. We rely on community support to help us reach more young childen with autism. Without your support, children may miss out. 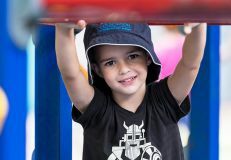 Together, we can achieve our goal of giving every Australian child with autism the early intervention they deserve so they can reach their full potential in life. Let's be the difference and create brighter futures! There are various ways to make a donation, either through a direct gift online, sending in a cheque at tax time, or via an ongoing workplace giving program. You could ask your friends and family to make a donation to AEIOU in lieu of giving gifts or sending flowers at important milestones of your life. Leave a bequest to AEIOU, knowing your legacy will be to help change the lives of young children with autism, forever. Register for one of AEIOU's signature fundraising events, choose AEIOU as your beneficiary when fundraising for external events, buy a ticket to one of our supporter's events that raises valuable funds for AEIOU. Or perhaps you'd like to host your own event, or nominate to raise funds for AEIOU on your next big hiking or cycling adventure. The only limit is your imagination. Find out how you can get involved. Our corporate and community partners are the backbone to our organisation. We value our relationships with our partners and work closely with them to ensure our relationships are mutually rewarding. Learn more here. Volunteers are always welcome! Sign up to volunteer at one of our exciting fundraising events - feel good about giving back to the community. For more information about our events or how you or your company can get involved please contact our Fundraising Department by phoning 07 3212 1110 or email giving@aeiou.org.au.